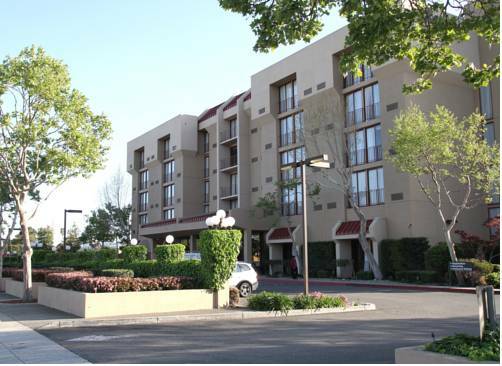 Near the San Jose International Airport (SJC), the Four Points by Sheraton San Jose Airport is close to downtown San Jose and Silicon Valleys tech companies. Popular nearby attractions include Levi Stadium, SAP Center, the Winchester Mystery House, Californias Great America amusement park and renowned vineyards. Guest rooms are spacious and feature free wireless High Speed Internet Access, an ergonomic desk, a 37" flat screen TV, a laptop safe and the Four Points signature bed. Free in-room coffee and bottled water are provided. The hotel has a free airport shuttle, a business center, a fully-equipped fitness center and outdoor heated pool. The Hangar Bar and Grill serves breakfast, lunch and dinner daily. Our menu offers innovative takes on classic American dishes. Watch a game on our large TVs and enjoy a local craft beer, glass of wine, or a handcrafted cocktail. The hotel offers 4700 sq. ft. of versatile function space suitable for intimate social events to larger business meetings. Hangar Bar and Grill: Our casual Hangar Bar and Grill uses fresh, sustainable ingredients to prepare American-fusion comfort dishes that are served in an inviting neighborhood atmosphere.